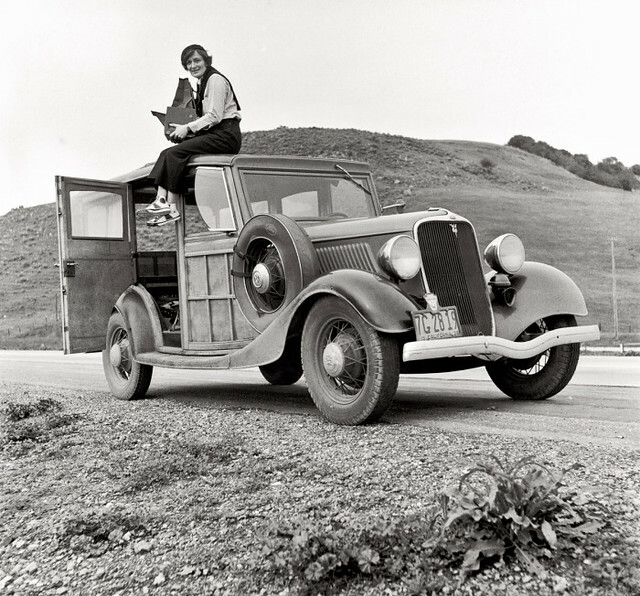 Dorothea Lange, Resettlement Administration photographer, in California atop car with her giant camera. February 1936. 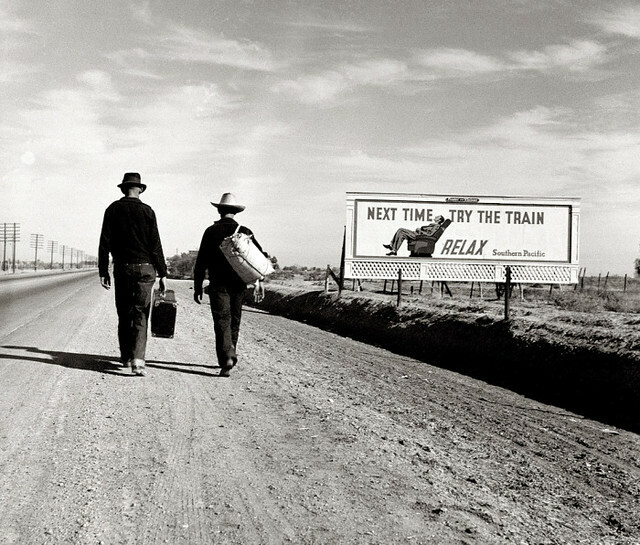 Dorothea Lange started her career in the 1920s as a commercial photographer in San Francisco; but in the 30s, as the Depression took hold, she instinctively tool her camera to the streets. Then in 1935, Lange began her landmark work for the Farm Security Administration, a Federal Agency. Collaborating with her second husband, labor economist Paul S. Taylor, she documented the troubled exodus of farm families migrating West in search of work. 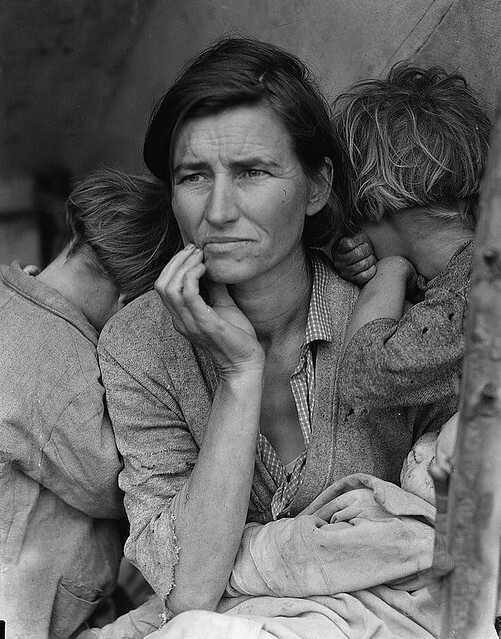 Lange’s documentary style achieved its fullest expression in these years, with photographs such as Migrant Mother becoming instantly recognized symbols of the Depression. “Migrant Mother” is one of a series of photographs that Dorothea Lange made of Florence Owens Thompson and her children in Nipomo, California. Lange was concluding a month’s trip photographing migratory farm labor around the state for what was then the Resettlement Administration. I saw and approached the hungry and desperate mother, as if drawn by a magnet. I do not remember how I explained my presence or my camera to her, but I do remember she asked me no questions. I made five exposures, working closer and closer from the same direction. I did not ask her name or her history. She told me her age, that she was thirty-two. She said that they had been living on frozen vegetables from the surrounding fields, and birds that the children killed. She had just sold the tires from her car to buy food. There she sat in that lean- to tent with her children huddled around her, and seemed to know that my pictures might help her, and so she helped me. There was a sort of equality about it. (From: Popular Photography , Feb. 1960). Read more of Lange’s extraordinary journey, and see more of her work at the ever-enlightening The Selvedge Yard. As we dust, we might recall that it was on this date in 1930 that the Bank of United States, a commercial bank in New York, suspended withdrawals and closed, seeking protection for the Superintendent of Banks. The prior day, a crowd had gathered at the Southern Boulevard branch in The Bronx seeking to withdraw their money. 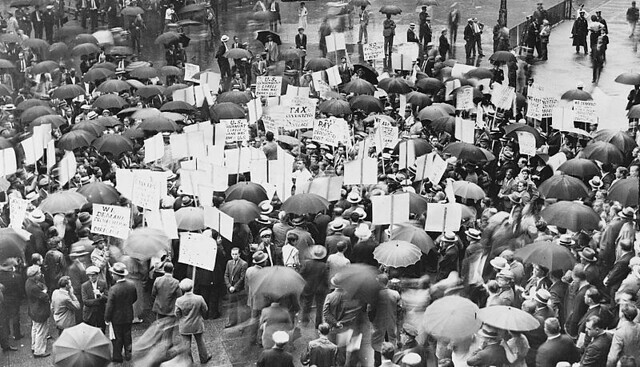 Though there had already been a wave of small bank runs in the southeastern part of the U.S. at least as early as November 1930, it was the run on the Bank of United States, reported by the New York Times and picked up by other metros around the U.S., that historians generally agree began the Great Depression.